Obama's Transgender Order Was Shut Down By The Pentagon: Good News Friday today on WallBuilders Live! We have more good news than we have time to share, which is good news in itself! Tune in now to hear about some of the good things that have been happening in our country recently. 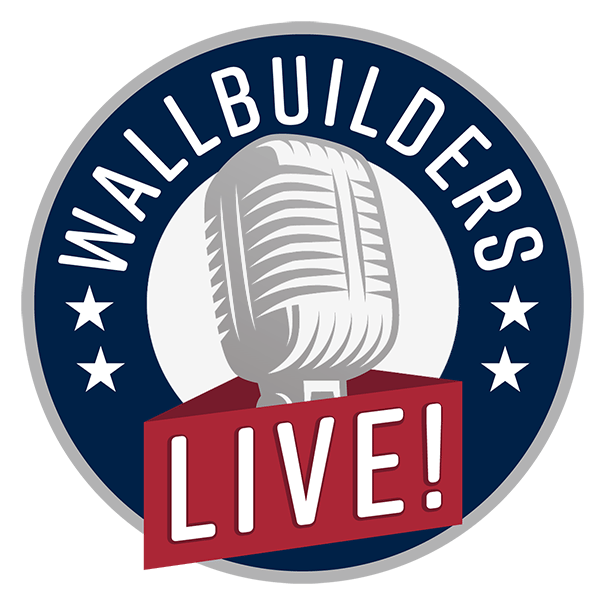 In this episode, we discuss things such as, how the Pentagon has shut down the Obama transgender order for the military, how a woman with a gun saved the day, and what caused an 85% drop in food stamp participation, and so much more, right here on WallBuilders Live! Should Congress Add More Justices To The Court: It's Foundations of Freedom Thursday, a special day of the week where we get to answer questions from you, the listeners! Always answering from those constitutional and foundational principles! Tune in today as we answer your questions such as, should congress add more judges to the court, how is the Chief Justice elected , what is the true meaning of the Confederate flag, and so much more, right here on WallBuilders Live! Anti-BDS Bill Just Passed In Texas, Here's What You Need To Know: In today's episode we talk with Phil King, a State Representative for Texas and one of the Senior Legislators in Texas, about the Anti-BDS bill that just passed. In this episode you will learn what the BDS movement is, why we need to be Anti-BDS, and how you can help positively impact Israel. Building on the American Heritage, How Education Shapes Generations: In today's episode, we are discussing the influence that has school on our children. As Abraham Lincoln wisely states, "The philosophy of the school room in one generation is the philosophy of government next." It is our duty to make sure the right history and philosophy get passed onto the next generation, because one day they will grow up to be our leaders. Tune in now to hear exactly how it is possible for you and me to change a generation through education. Refugee Crisis, Handling it With a Biblical Worldview: In this episode we talk about what the Bible says about refugees and how we should handle the refugee problem. We talk with Bishop E.W. Jackson on his article, " Christian Ethics And The Refugee Problem." Bishop E.W Jackson has great wisdom on this topic. He really addresses this issue from a Biblical and common sense perspective. Tune in to listen to this episode and get some clarity on the refugee problem we have today. Frugality And Taxation, The Principles of Limited Government, Part Three: Today we are doing a special program from David Barton on The Principles of Limited Government. We are going to be answering your most pressing questions such as, “What does it mean to have a limited government? Is that just money or is that also jurisdiction? How do you get a limited government? How do you reign in an out of control government? And what would it look like if we did things the way that our Founding Fathers envisioned that it would be done?" We're answering all these questions and more, right here on WallBuilders Live! Thomas Jefferson Explains The Principles of Limited Government, Part Two: Today we are doing a special program from David Barton on The Principles of Limited Government. We are going to be answering your most pressing questions such as, “What does it mean to have a limited government? Is that just money or is that also jurisdiction? How do you get a limited government? How do you reign in an out of control government? And what would it look like if we did things the way that our Founding Fathers envisioned that it would be done?" We're answering all these questions and more, right here on WallBuilders Live! God Gave Life Not Government,The Principles of Limited Government: Today we are doing special program from David Barton on the The Principles of Limited Government. We are going to be answering your most pressing questions such as, “What does it mean to have a limited government? Is that just money or is that also jurisdiction? How do you get a limited government? How do you reign in an out of control government? And what would it look like if we did things the way that our Founding Fathers envisioned that it would be done?" We're answering all these questions and more, right here on WallBuilders Live! An Update On The Recent Shooting, What You Haven’t Heard! An Update On The Recent Shooting, What You Haven't Heard! Congressman Barry Loudermilk who was one of the closest guys who didn't get shot but who has been shot at a number of times is going to share with us the details that you haven't heard! It is an unbelievable story that you don't want to miss! Briefing Trip, Equipping Pastors to Understand Our Faith Filled Heritage: In today's episode, we talk about the pastors only briefing trip to D.C. You can come and learn more about the spiritual heritage of our nation. Not just seeing the sights but understanding the significance of what they are and what they represent. It's just so encouraging to know you've got these Godly men and women that are there serving in our country and doing all they can to turn the country back. It just gives you hope that you're not alone and that there are others that care and that God is using. Tune in now to hear more about this Briefing Trip to D.C.